Here we go again! 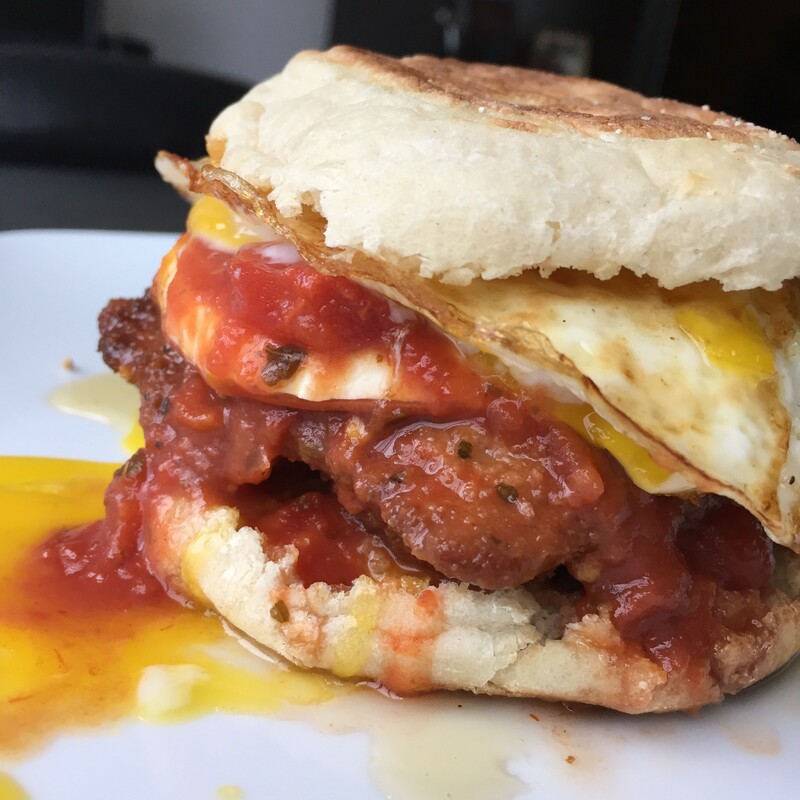 Thanks to The Brunch Boys, I took another magical food and turned it into something completely unnecessary but amazingly delicious. I was inspired by pizza again (because who isn’t?) and this time it’s coming from Roberta’s in Bushwick, Brooklyn. One of my all time favorite pies is their Bee Sting pie: tomato sauce, spicy soppressata, mozzarella, and honey. MmmMmmMmm. No words. Spicy, salty, sweet, creamy…pleasing to all the senses, I promise you. In this video, you will see me take these elements from the Bee Sting and turn them into something else. 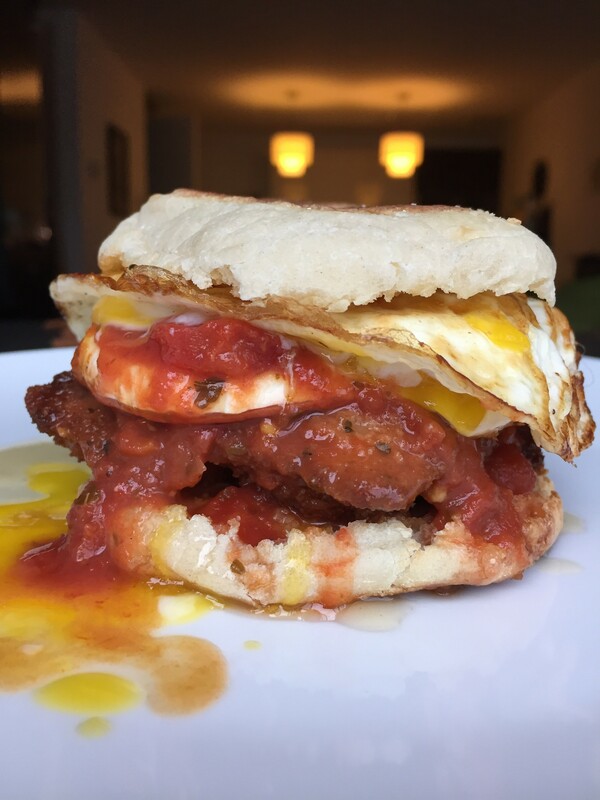 Some of you may remember my Holy Ravioli sandwich, proudly featured on Food & Wine’s Instagram last year (shameless plug at it’s finest), and this is what it’s all about: fried mini cheese raviolis, spicy marinara sauce, smoked provolone, and a fried egg on a garlic buttered English Muffin. Ridiculous, but worth it. 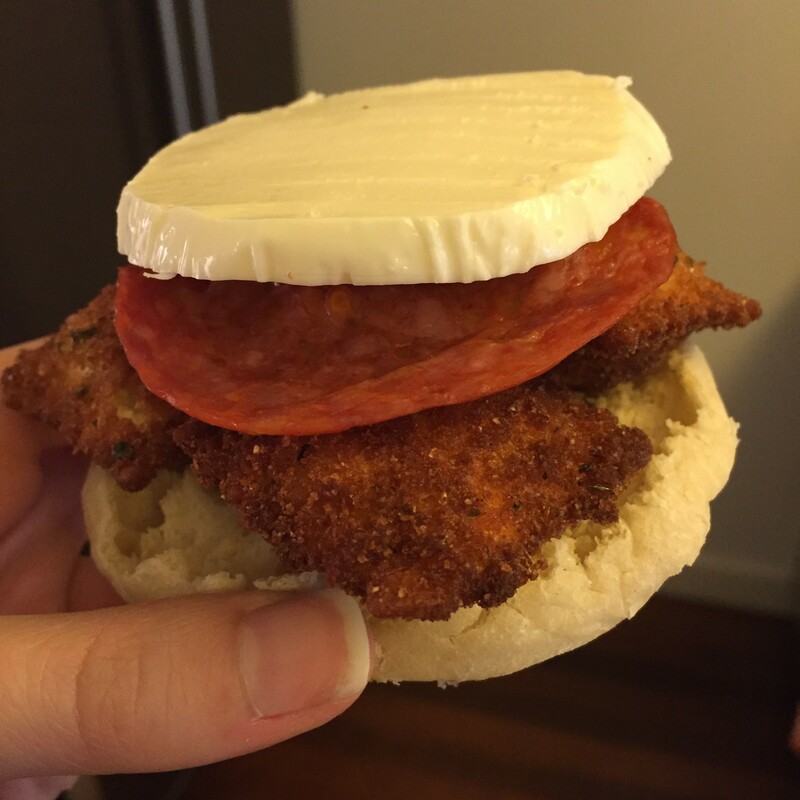 The Roberta’s twist is: swap provolone for mozz, add spicy soppressata, add honey. Bingo bango, you have delicious insanity. For Homemade spicy marinara, click here for the original recipe! Or, be lazy and use a jar sauce you like and add some chili flakes to it. I did that a couple times because making my own sauce is not appealing 100% of the time. Heat vegetable oil for frying in a deep fryer or heavy pot. Slice the fresh mozzarella into 1/2 inch thick slices. Set aside. Bread your ravioli! 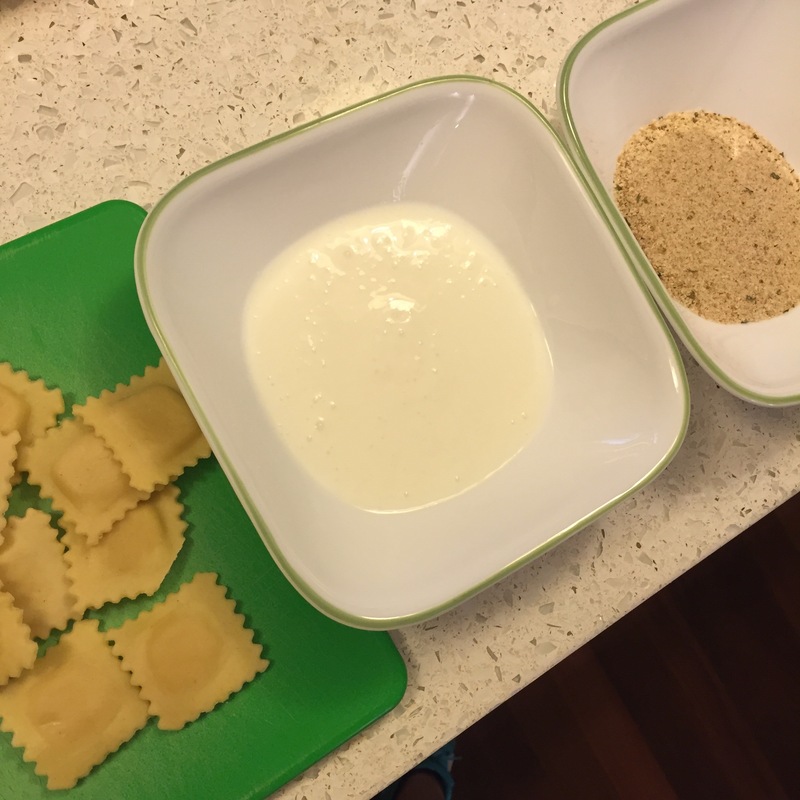 Set up an assembly station of ravioli, buttermilk, and breadcrumbs. Dredge lightly in the buttermilk, then breadcrumbs, and set aside. Easy. Fry em up! 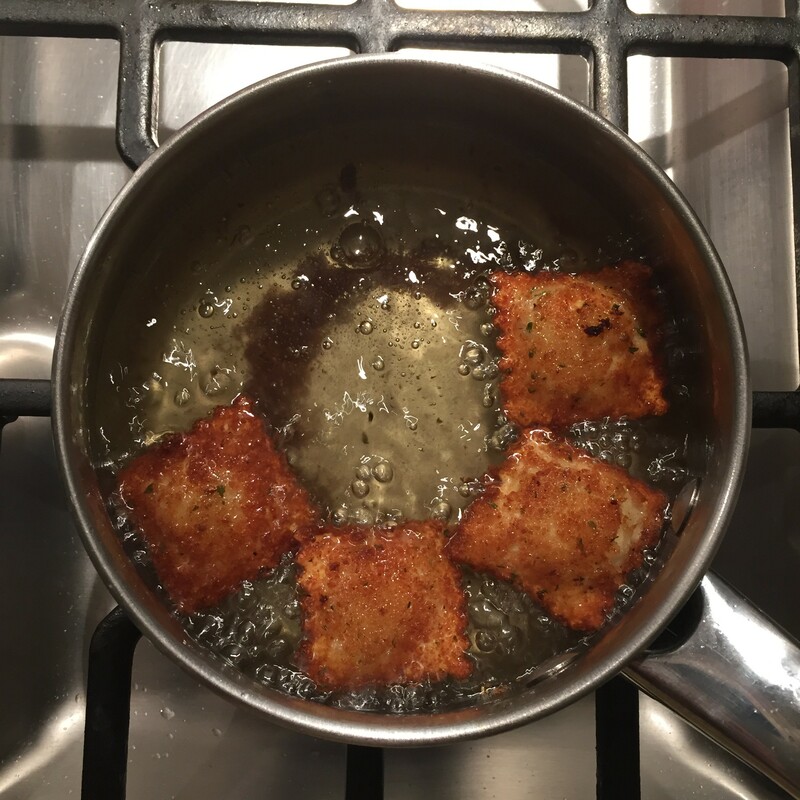 Drop 3-4 raviolis in the hot oil (carefully) and fry a couple minutes until golden brown. Flip once and fry for another 30 seconds to a minute. Drain on paper towels. Heat a small nonstick or cast iron skillet over medium-high heat. 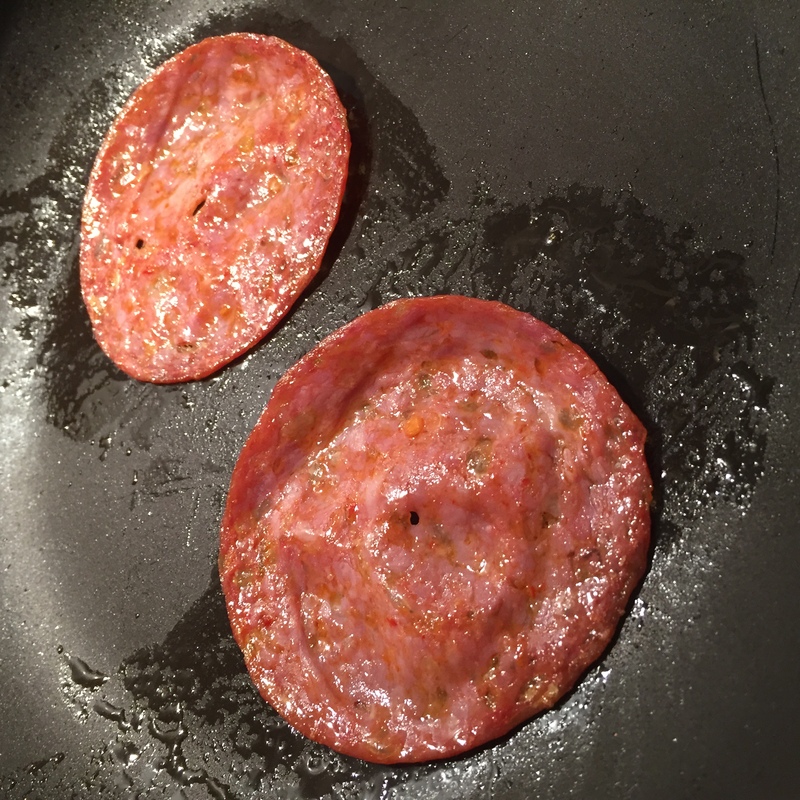 Drop a slice of soppressata (or two if you can fit it) in the skillet and fry until slightly crisped on the edges. Remove from pan and set aside. Keep the skillet on and lower to a steady medium heat. 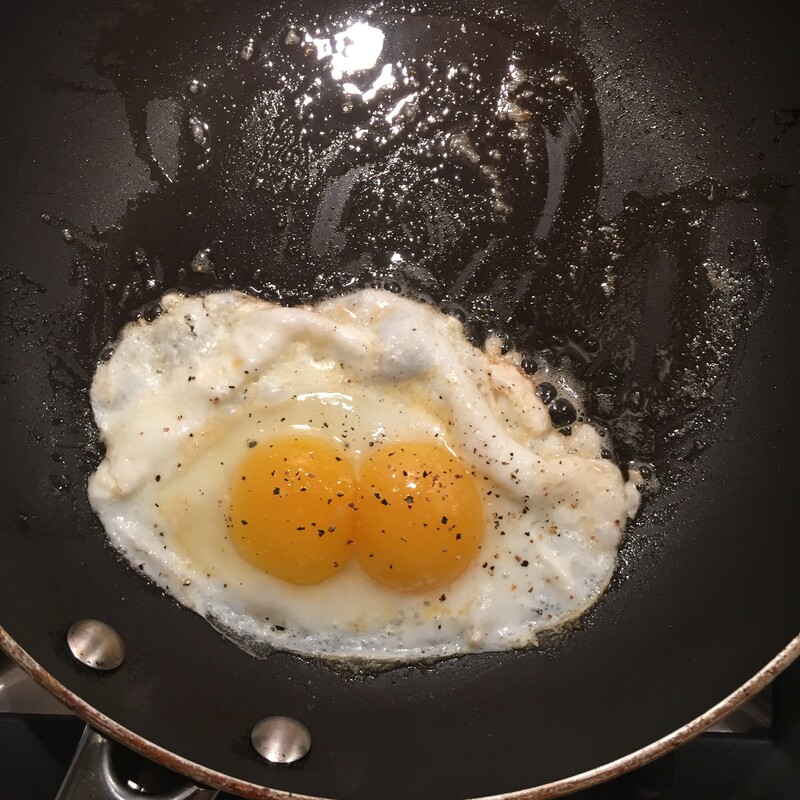 Time to fry the eggs! Do one at a time, or if your kitchen is not slanted, I suppose you could do them all on a flat griddle. Just try to keep the egg whites from spreading out too much. You want the egg to fit ON the sandwich. Cook for a few minutes until the whites are set, aka should not be runny and no longer translucent. 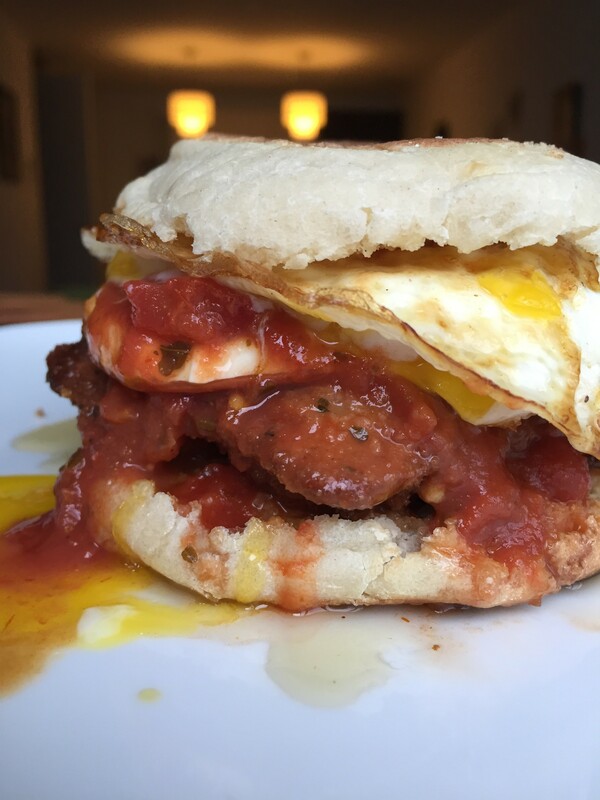 The yolk should still be runny, but if you don’t like it runny, you can just continue cooking. I flip the egg in the pan or with a spatula to make it over-easy with a runny yolk. That’s how I like it. This is a matter of preference. While frying, toast the English Muffins. Spread the butter on each side. You can do one side but that’s silly. This sandwich isn’t meant to be light. Assemble your sandwich! 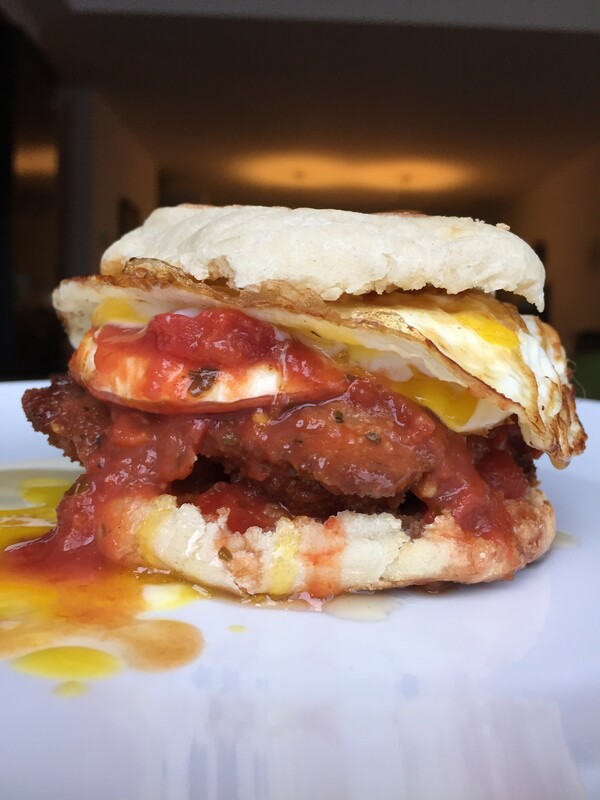 Layer as follows: fried ravioli (3-4 per sandwich), tomato sauce, soppressata, mozz, fried egg, honey. Close sandwich. Take a big bite and savor the salty, sweet, spicy, fried goodness.